Ameripack is recognized worldwide for having the most durable, most innovative Rotationally Molded Shipping and Storage Containers. Ameripack offers the largest assortment of sizes available from any source. We will work closely with you to define, develop and provide the perfect solution to your on-going packaging and storage requirements. All Roto-Molded Shipping and Storage Containers are produced to the rigorous specifications of MIL-STD-810G as well as the Airline Transportation Association and comply with the ATA 300 Category 1 specification for 100 trip applications. Roto-Molded shipping and Storage containers can be produced to be airtight and water tight. These containers are rugged, durable, and as tough as any molded plastic container you will find. 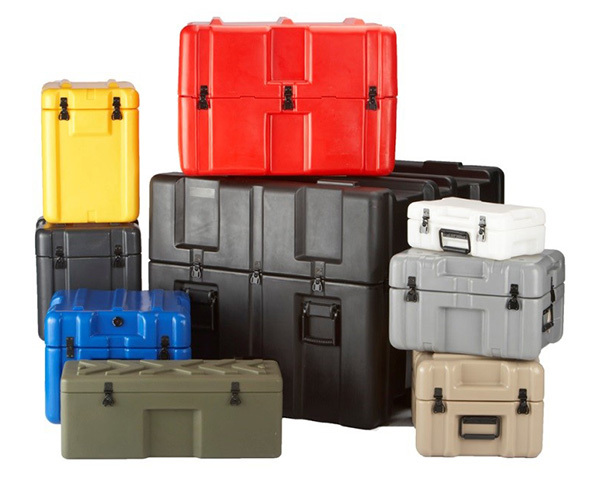 The Ameripack line of single lid rotationally molded containers are among the strongest, most durable molded cases available anywhere. With nearly unlimited options available for these cases we will be able to configure these cases to meet your specifications. Ameripack’s cases are built standard with black coated steel hardware that will last through even the toughest environments, while the rotational molding process produces the strongest corners and edges available in lightweight plastics today. Many of our cases feature molded in edge casters and a pull handle. Most of the cases that do not include this feature as a standard can still have casters added to them after molding. The gasket groove of our containers allows for a Pressure Relief Valve to be installed that makes these cases both airtight and watertight. Other features include four bottom casters, both fixed and removable sets, card holders, tie down rings, lifting rings, panel rings, custom foam interiors, and many other options. 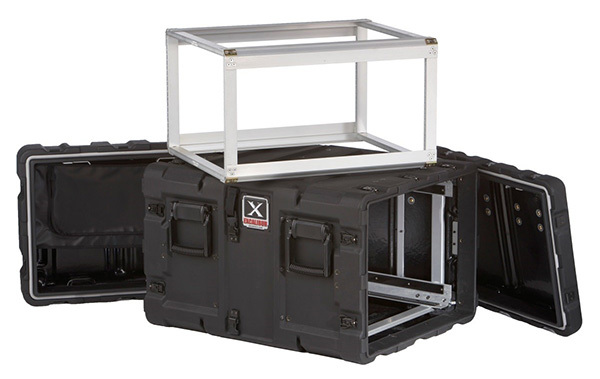 The Ameripack line of Excalibur Shock Rack Cases is unsurpassed in quality and durability. These tough as nails cases are more compact than most of our competitors due to the specially designed molded shock mount that are employed to absorb the shock and vibration that they will typically experience during transit. Each of the cases in our Excalibur line can be made as a slide out rack, a fixed rack, and can also be molded in a light weight version to meet all of the demands your customers may require. Some of the more common options that we see on these cases include fixed or adjustable mid rails, 3X5 card holders, airtight/watertight construction, and tie down rings. 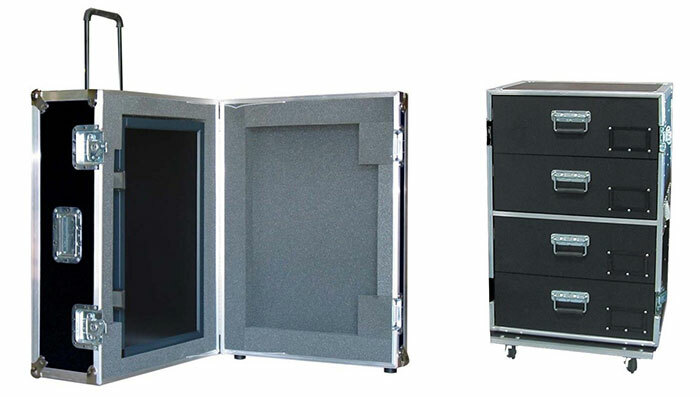 Whatever your rack may require, the Excalibur line of cases will have an option to meet your needs. While other case companies struggle in customizing your cases, Ameripack will excel. Ameripack has trained packaging engineers on staff in New Jersey as well as engineering available in Minnesota. Using SolidWorks, we are able to trade files with our customers and allow you to see what we will be building in 3D before any work is started. 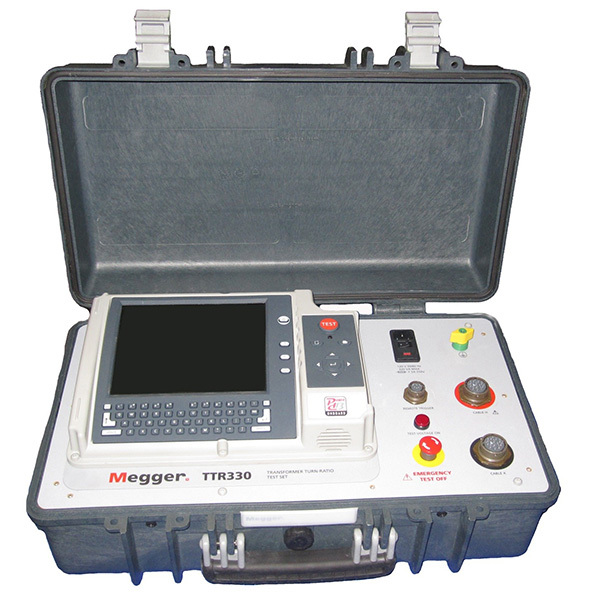 Besides the everyday customization that we are known for like custom foam inserts, stenciling, labeling, and panel mount applications, Ameripack also has the capability to fully machine your cases so they are ready to accept an airtight/watertight connector that you have spec’ed into your design! Need legs for your case to make it a table? No problem, we can do that! Whatever custom case needs you have Ameripack can fill them using any of our own line of products or the thousands of cases that we distribute. Are you tired of not finding the right size cases for your application? Well look no further – Ameripack can customize a fabricated case to meet any of your needs. These cases, often called Road Cases or ATA cases, are made to keep your gear safe in even the worst environments. Our fabricated cases can be made from several different thicknesses of plywood to meet your strength requirements and can have many different colors laminated to the exterior to give you the right look for your products. Worried about the weather damaging the wood? No problem – Ameripack has this covered by having the ability to make many of our fabricated case styles out of plastic materials for a more durable life span or to reduce the weight. Our expert engineering staff can design the interiors to protect even the most delicate of parts. When you cannot find the molded case size you need, our fabricated cases will keep your project moving forward.